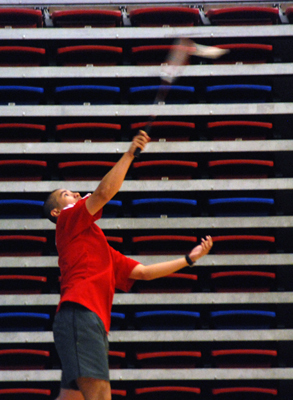 The whir of birdies and squeaking shoes echoed through Capilano University’s gymnasium Saturday afternoon, as local universities badminton teams swung-it-out during the first rounds of a two-day tournament. Peter Hawn and Tony Lee of Kwantlen defeated Langara’s Terrence Tung and Danny Luu in the men’s double to clinch a spot in the finals which begin Sunday at Capilano University. “We’re doing pretty good as a team,” said Lee. “We’ve so far won all the team events – although we haven’t played Douglas yet.” The players looked confident and relaxed, ready for the next round which will consist of winners from today’s game. Like their male counterparts, Tuyen Pham and Michelle Zhang of Kwantlen blew past Capilano in the ladies doubles, effortlessly advancing to tomorrows finals. In other events, women’s single player Grace Wang is favoured to win against Sandy Neil of Langara, in a match that will be held in the late hours of Saturday. From the looks of things, Kwantlen may be poised to win most of the events in this two-day tournament.